Through their membership in the American Boating Association, thousands of boaters and boating enthusiasts from across the nation share a common mission - working together to improve the safety, affordability, environmental cleanliness, growth and fun of our sport. An additional benefit of your American Boating Association membership is ABA Online®. As a boater, you want timely, up-to-date information on emerging trends and boating products and services as well as money saving discounts and information. ABA Online gives you immediate access to all of that and more - so you get the help you need to take the hassle out of owning and/or operating a boat. Check back here regularly for updated boating information, new programs, and more discounted services available only to you as an ABA member. Join with us today and play an important role by supporting and using the many ABA programs available. Membership is only $15 a year and every time you take advantage of any one of the many member benefits, you also support the ABA mission. What an easy way to make a difference! Membership is FREE for one year when you request a quote for ABA boat insurance, boat financing or refinancing; RV financing; book travel through our Online Travel Booking Service; or apply for our ABA Platinum VISA card. For more information on all of the benefits of ABA membership, click here. To contact ABA, click here. ABA is headquartered in New Market, MD. 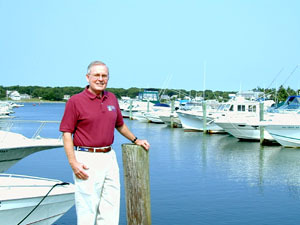 Founder and President Bill Condon is a long-time marine insurance executive and an avid boater for over 40 years who truly understands the joys and heartaches of today's boat owner. He and his crew are dedicated to providing ABA members the information, products, and services to improve the safety, affordability, environmental cleanliness, growth, and fun of their boating experiences. ABA is a proud member and supporter of the National Safe Boating Council, The National Water Safety Congress, and the National Youth Marine Alliance.